This "Trip" Is More Than Worth The Fare! Home can have a powerful pull on a body. Horton Foote’s “The Trip To Bountful,” at the Stephen Sondheim Theatre through July 7, is a tale of yearning to return. 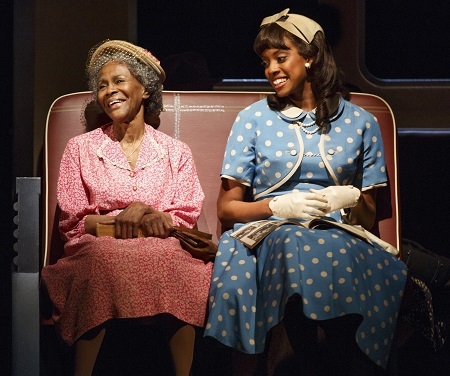 Mrs. Carrie Watts (Cicely Tyson) wants to go back, away from the bickering old woman she’s become. Her frivolous daughter-in-law Jessie Mae (Vanessa Williams) provokes her to be her worst self. Ludie (Cuba Gooding, Jr.), her son, is sweet and ineffectual. Mrs. Watts’ life with them in a two-room apartment in has her longing for her childhood home in Bountiful. The farm town may as well have been named in irony; there is nothing left of it since it’s soil blighted by overuse. To Mrs. Watts, it is a wonderful memory she longs to revisit before she dies. Vanessa Williams and Cuba Gooding, Jr. Photo by Joan Marcus. “I think Ludie knows how I feel about getting back to Bountiful. Once when I was talking about something we did back there in the old days, he burst out crying. He was so overcome he had to leave the room,” she tells Thelma (Condola Rashid), a stranger who befriends her during her “escape” from Houston. 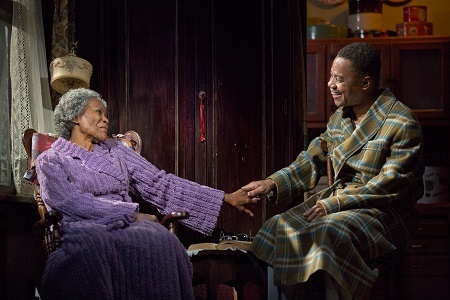 Cicely Tyson and Cuba Goofing, Jr. in “The Trip To Bountiful” in a photo by Joan Marcus. In the interest of full disclosure, “The Trip To Bountiful” is a personal favorite among Horton Foote’s extensive repertoire. 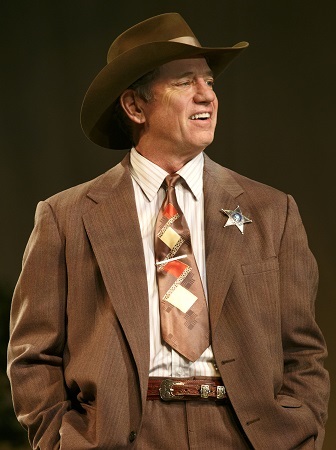 Foote’s first producd play dates back to 1941 with the off-Broadway production of “Texas Town.” (A theme revisited in Primary Stages production of “Harrison, TX.”) Foote, who died in 2009, had a long and much-feted career, with many a Broadway hit; Foote was the recipient of numerous awards — including the one bestowed by the Academny of Motion Picture Arts and Sciences. Tom Wopat is charming in a small role as Sheriff . Photo by Joan Marcus. 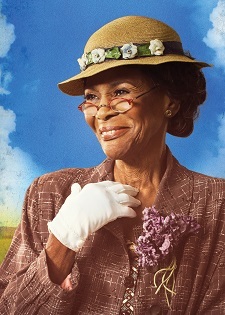 This superb cast, anchored by the outstanding Cicely Tyson, with strong performances by Vanessa Williams and Cuba Gooding, Jr. bring Foote’s lovely tale to its fullest flower. Tyson’s many awards over her illustrious career, including Emmys and a star on the Hollywood Walk of Fame. Her Broadway appearances began in the late 1950s, as an understudy in “Jolly’s Progress,” and included the 1983 production of “The Corn is Green,” and a few performances (once as a host) at Tony celebrations over the years. There already is a lot of chatter suggesting she might win this year’s Tony! You would not know it while watching Cuba Gooding, Jr.’s nuanced performance as Ludie that this is the Academy Award winner’s stage debut. On the other hand, Vanessa Williams, a multi-Grammy award winner, has plenty of experience acting in theater; in 2002, she got a Tony nod for her portrayal of the Witch in the revival of the Sondheim “Into The Woods.” Up-and-comer Condola Rashid, Tony-nominated for her role in “Stick Fly” in 2012, doles out a pitch-perfect performance. of a travelling bus, under the supervision of Hudson Theatrical Associates. In Houston, Cowie’s set describes the oppression of a cramped apartment, giving the stars a small space in which to work. The Watts’ ground floor is overladen with the darkened windows of neighbors above them. Note the nod to the color of the casting, and the times of the play, set in Texas in 1953, in the sign pointing to the White Waiting Room at the bus depot. Under Michael Wilson’s direction, there isn’t a misstep in the journey of “The Trip To Bountiful.” Go and spend an evening travelling in the world Horton Foote has created. For more information on “The Trip To Bountiful,” please go to The Trip To Bountiful on Broadway. 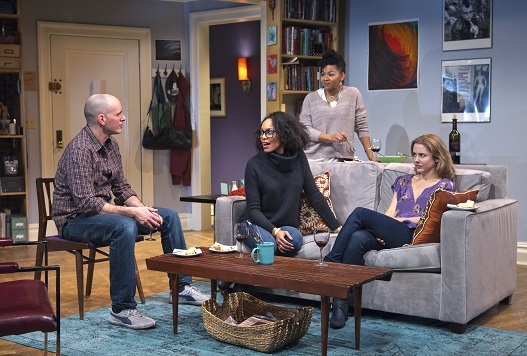 Kelly AuCoin, as Peter, Kerry Butler as Annie with Eisa Davis as Rebecca and Crystal A. Dickinson as Drea in Tanya Barfield’s “The Call” at Playwrights Horizons. Photo by Jeremy Daniel. Couples desperate to be parents often use hope and sometimes each other in their efforts to conceive. 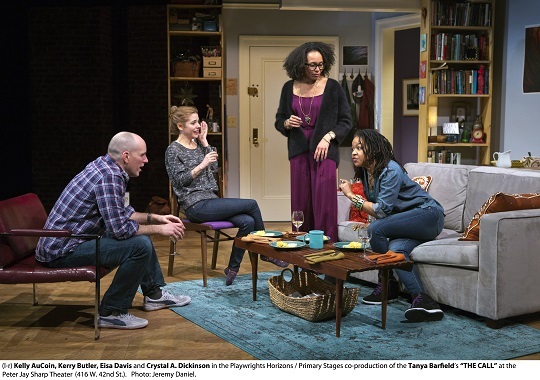 In Tanya Barfield’s new drama, “The Call,” in a joint Playwrights Horizons and Primary Stages production at the Peter Jay Sharp Theater extended to May 26th, the struggle to adopt just prolongs the agonies of a young married pair. Annie (Kerry Butler) and Peter (Kelly AuCoin) suffer mightily for the want of a child. One can see the yearning in Peter’s eyes as they assemble a crib in their spare room. Kerry Butler as Annie, Kelly AuCoin as Peter, Russell G. Jones as Alemu, Crystal A. Dickinson as Drea and Eisa Davis as Rebecca in Tanya Barfield’s “The Call.” Photo by Jeremy Daniel. Over dinner with a couple, Drea (Crystal A. Dickinson) and Rebecca (Eisa Davis) who have just returned from Africa where they got married, share their expectations of a private adoption. When the birth mother backs out, Peter and Annie are unmoored. Peter presses Annie into seeking help from an agency. The fact that the child they hope to parent will come from Africa stirs up concerns from them and their friends and a neighbor. Kelly AuCoin as Peter with Eisa Davis as Rebecca, Crystal A. Dickinson (standing) as Drea and Kerry Butler as Annie in “The Call.” Photo by Jeremy Daniel. “The Call,” directed by Leigh Silverman moves a bit slowly through the first act, but is grippingly transcendent in the second. The actors acquit themselves splendidly, with Russell G. Jones, as Alemu, an odd African neighbor of Peter and Annie’s, adding a poignant humor to the story. Crystal A. Dickinson stands out in the fine ensemble as Drea, the truth-talking girlfriend of Peter and Annie’s old friend Rebecca. 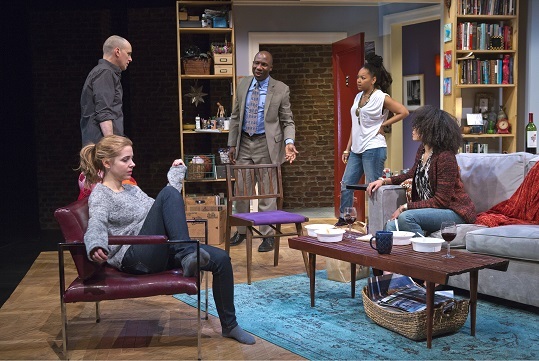 At its heart, “The Call” is a parlor drama, exploring relationships, race and responsibility in a well-written, intelligent play that is also thought-provoking and likeable. 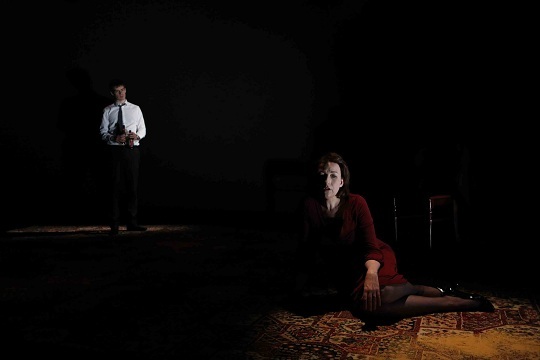 For more information on the joint production of “The Call,” visit www.PlaywrightsHorizons.org and www.PrimaryStages.org. Check out “ONE NIGHT STAND,” opening April 26 and playing through May 2nd at the Quad Cinema, a backstage documentary, chronicling the production of The 24 Hour Musicals in which teams of top-notch musical theater talent have 24 hours to create, cast, rehearse and put on a live benefit show. See Cheyenne Jackson, Richard Kind, Rachel Dratch (among other performers) and directors like Sam Gold, along with writers and composers like Jonathan Marc Sherman and Benj Pasek and Justin Paul. 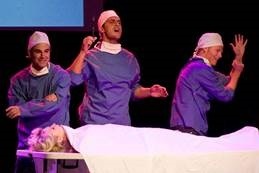 The pressure cooker environment behind the scenes as 4 short musicals come to life was echoed by the crews behind the camera as they plunged into a sleepless shoot. Produced by Elisabeth Sperling and Trish Dalton with the assistance of 10 shooters, four production assistants, and three editors, “ONE NIGHT STAND” is a wonder of improvisation and inspiration. The Wild Project, a production and venue for emerging artists and new theater, film and visual arts, has on-going programming to entertain and enlighten. Catch Kara Manning’s “SLEEPING ROUGH,” through April 27th, for instance in which an American woman spews graffitti of discontent all over London. Next, “ALONDRA WAS HERE” by Chisa Huthcinson, takes the stage, from May 4th to the 18th, with a tale of politics and brutality. For more information about these and other productions at The Wild Project, visit www.thewildproject.com. You think you can dance goes on parade with the Shakedown Dance Collective, a gang of 55 people of all shapes and sizes, ages and aspirations, under the tutelage of professional dancers Jamie Benson and Deborah Lohse. 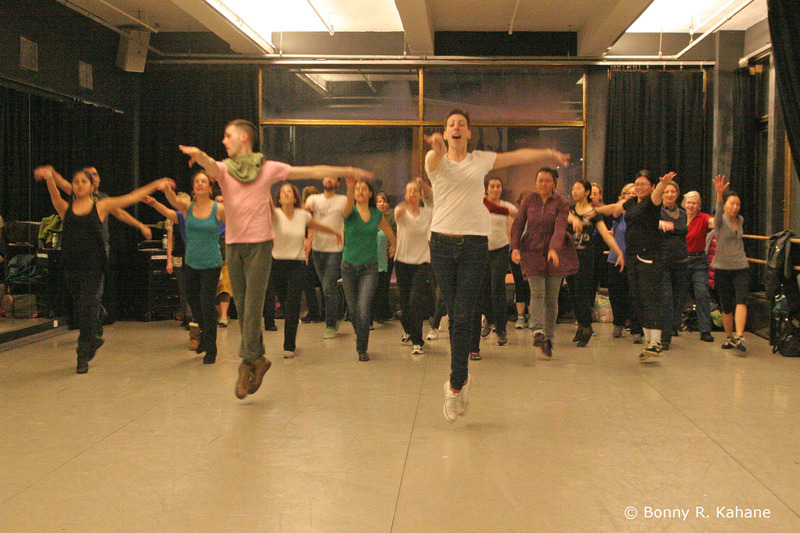 The Shakedown consists of weekly 2 hour dance rehearsals that prepare would be dancers for performances throughout New York City.Lohse and Benson have declared Sunday, April 28th “International Dance Day” with a Gala at Dixon Place. On May 18th, join Shakedown for “DANCE PARADE NEW YORK,” from 1pm to 7pm from Broadway to Tompkins Square Park. This is what a Shakedown class looks like! Photo by Bonny Kahane. http://7thannualinternationaldanceday.eventbrite.com/# for tickets for the International Dance Day Gala. “I AM AN OPERA” in a photo by Tim Hailand. 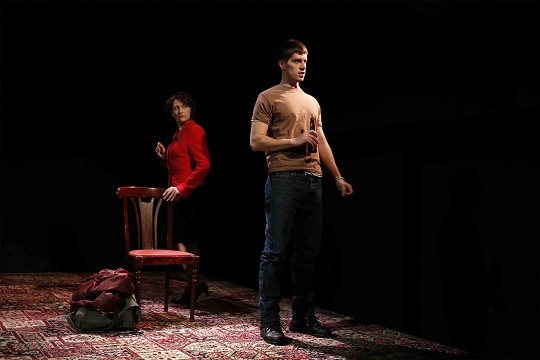 “I AM AN OPERA,” at Dixon Place through April 27th, takes us from a large crowd to a one man show, in which Joseph Keckler, writer/performer, sings arias of lament and exultation. “I AM AN OPERA” details Keckler’s life as a portrait of the artist taunted by demons, tripping on hallucigens, and suffering through day jobs. 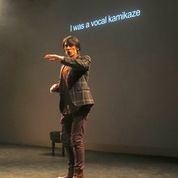 Joseph Keckler in performance. Photo by Gerry Visco. To learn more about “I AM AN OPERA,” please visit dixonplace.org. 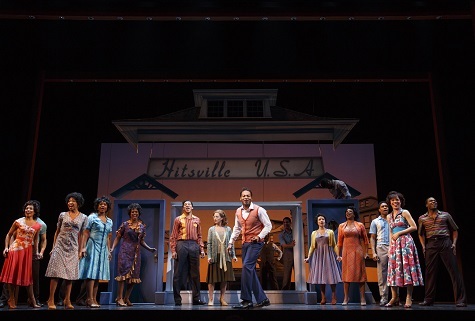 “Motown The Musical” is a cover of many of the great hits Gordy’s studio produced over the years. With success came disappointments. The Supremes’ songwriting team of Holland, (Daniel J. Watts as Eddie), Dozier (Julius Thomas III as Lamont), Holland, (Eric LaJuan Summers as Brian) were among the first of many defections from the Motown labels. As soon as the acts Gordy cultivated gained popularity, a big studio swept in to gobble them up. “Motown The Musical” is part revue, part Awards Tribute show, and part an evening at the Palladium. 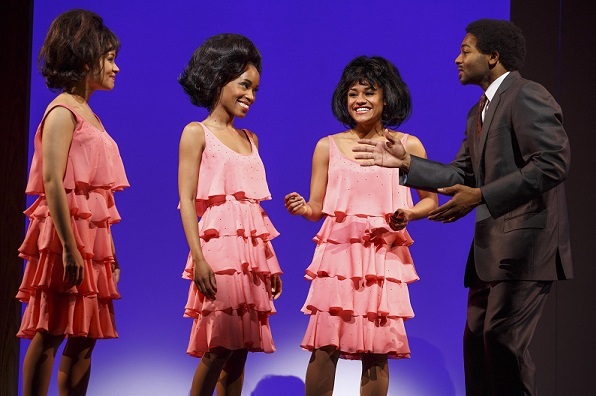 With the grandiloquent flair Gordy demonstrated as an impresario, “Motown The Musical” is visually splendid. The choreographic numbers, by Patricia Wilcox and Warren Adams, from the celebratory dance after Joe Louis’s victory bout in 1938 to the smart-stepping moves of the Temptations, put a lively time-stamp on each scene. David Korins, sets, and Esosa, costumes, add their eye-catching verisimilitude to the timeline. Its story line is a little weak, but its production values are high and very stylish. 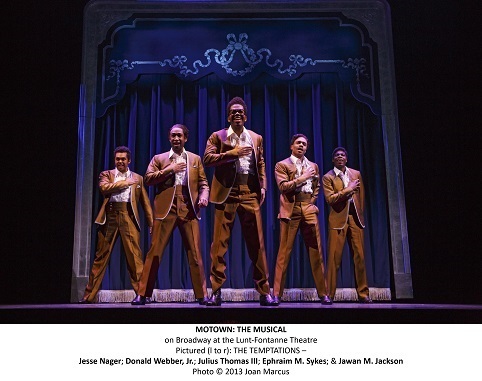 For more information on “Motown The Musical,” visit http://www.motownthemusical.com/. 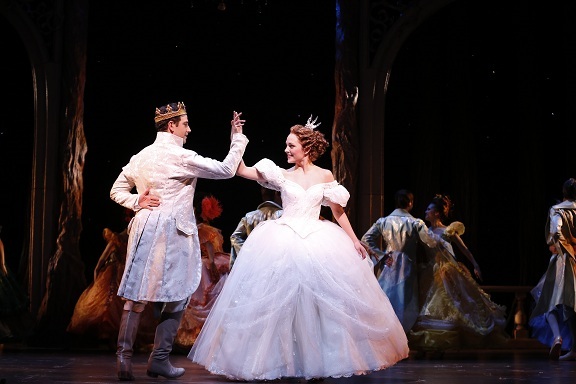 Waltzing With The Prince: "R+H’s Cinderella" On Bway! Little girls dream of dressing in gowns and looking like a princess, and, as they get a little older, of charming princes who can whisk them off to a castle. The fantasy in “Rodger’s + Hammerstein’s Cinderella,” in an open run at the Broadway Theatre, is about transformation and aspiration. Poor Cinderella (Laura Osnes) leads a terrible life, toiling at thankless tasks for her thankless stepmother, Madame (Harriet Harris) and ne’er-do-well stepsister Charlotte (Ann Harada) and the nicer Gabrielle (Marla Mindelle.) She dreams of escape, “In My Own Little Corner,” and goes back to work mending and cleaning. Laura Osnes as Cinderella and female ensemble. Photo by Carol Rosegg. Douglas Carter Beane sees in Cinderella both the hopes for betterment and the determination to make a better world in his script adaptation of the Rodgers and Hammerstein original TV production. His take is perhaps just a little too up-to-the-minute. Or maybe, it contributes to making “Rodgers + Hammerstein’s Cinderella” so much more than a made for TV version of a timeless fairytale, even if that 1957 live broadcast featured Julie Andrews in the heyday of television. There is a shiny sort of do-good, feel-good quality to Beane’s rescripting, and to the lyrics he and David Chase have added to Rodgers and Hammerstein’s original. Santino Fontana as Prince Topher and Laura Osnes as Cinderella at the ball. Photo by Carol Rosegg. Laura Osnes, whose ascent to Broadway was as the winner in a TV contest for her role in “Grease,” has proven to be the quintessential stage actor. She is also more than a made for TV star. Since being “discovered,” she’s done yeomen’s work in the much-maligned “Bonnie and Clyde,” subbed seamlessly for Kelli O’Hare as Nellie Forbush in Rodgers and Hammerstein’s “South Pacific,” played Hope Harcourt in “Anything Goes.” She’s performed at Carnegie Hall and in concerts at 54 Below. In short, Laura Osnes is a genuine Broadway actor. Cinderella’s desires and dreams resonate as they always have. She’s just a little pluckier and gutsier than you might remember her. Her Prince Topher (Santino Fontana) is a little more evolved and sensitive, too. Santino Fontana is delicious as Prince Topher. Ann Harada gets to sing one of Rodgers and Hammerstein’s most wonderful anthems, “The Stepsister’s Lament” with a touch of irony and innocence. Marla Mindelle as the stepsister who falls in love with a rabble-rousing poor boy, Jean-Michel (Greg Hildreth) is endearing, as is Greg Hildreth, in an endearing subplot. Victoria Clark makes a sweet Fairy Godmother, Marie although she looks a bit uncomfortable during her stint in the air. What would Cinderella’s trip to the ball be without exquisite costumes? We don’t have to imagine anything so dire, since William Ivey Long gives us glamourous gowns worthy of a fairytale and happy endings. Anna Louizos’s sets are also gorgeous and imaginatively rendered. Paul Huntley’s headdresses are extravagant enough to make hair and wigs a character. 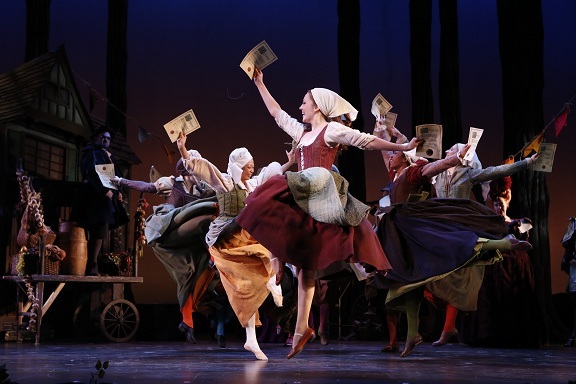 Mark Brokaw ‘s direction keeps “Rodgers + Hammerstein’s Cinderella” moving at a lively pace. “Rodgers + Hammerstein’s Cinderella” will make your wish for a captivating evening come true.